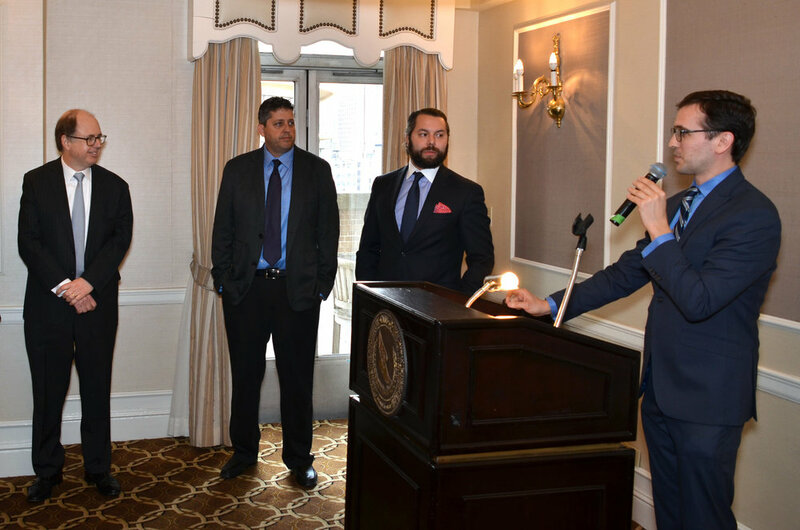 The annual Form VI Alumni Association Breakfast took place on Wednesday, April 19. Head of School John Botti and Alumni Association President Andy Sandberg '01 led the festivities in recognizing each member of the Class of 2017 with a special gift from the Alumni Association in honor of the seniors' upcoming graduation. The following officers, Trustees and alumni faculty members also spoke to the boys about their involvement with the Alumni Association: Stuart Orenstein '00 (vice president of the Alumni Association), John Moran '97 (secretary of the Alumni Association), Jeffrey Landes '83 (Trustee), Richard Weaver '75 (Trustee), Sandy Pelz '71 (director of college guidance), Andrew West '92 (director of athletics) and Jeremy Katz '04 (director of communications design). Director of Institutional Advancement Jim Simon, Head of Upper School Jim Reynolds and Director of Alumni Affairs Laura Lanigan were also in attendance. The Alumni Association looks forward to Graduation Day, when these 25 members of the Class of 2017 will officially join its ranks!